62.6% ROI US$3225 on AT&T (T) in 2 days using our strategy! The world is our oyster in the investment world, especially the US market! Join us on our seminar! 45% ROI , US$1840 profit in 1 trading day on Apple! Liquidate position for short term trades! On Monday, market goes a bit tense about the week unfolding. After the QE expectation increase, market turned soft and Dow turns a bit red. Like what I said about this week's trading plan, we should sell into the rally before Ben's speech. Btw, mid to long term I am still bullish... just short term wise, be careful. I did, I have already liquidated 4/5 of my positions. Like Apple, that I urged everybody to buy. Do you remember? 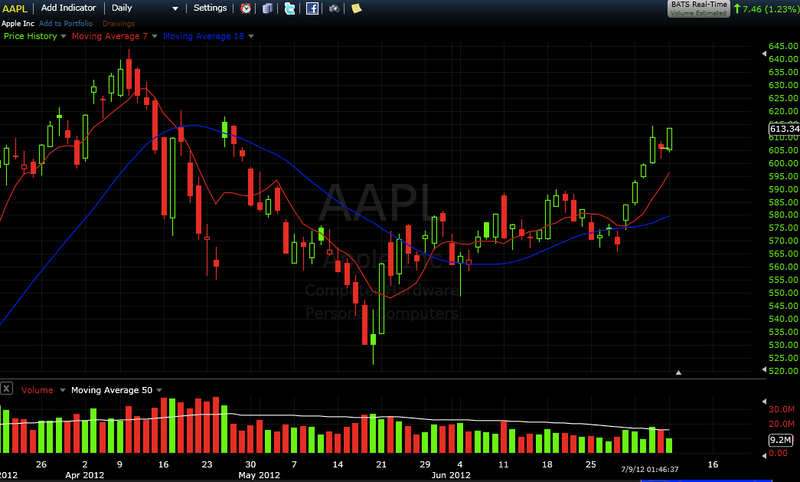 Last week, I asked everybody to look at Apple at $570 when it gaps down. I told everybody that $570 might be the lowest price it will reach. Buy offensive sector. It reached a high of $599. Yes, I sold my apple position that I entered on Friday. Currently, Big Ben is to speak on FOMC on Wednesday at 2.15pm Eastern time as scheduled in our economic calendar. It is different from what is stated in the federal reserve website where it says the FOMC meeting is from 31st July to 1st Aug. I also confused about the time. But anyway, after the last few powerful rally days, market is a bit hesitant now. As I have mentioned, our strategy as a trader is not to undertake RISK, the RISK of no QE or strong policy from Europe may cause market to fall. Question: Should I short Wilmar next week? Shorting is probably ok only if it breaks $3.17. Currently $3.20 is a support. Why I said so? 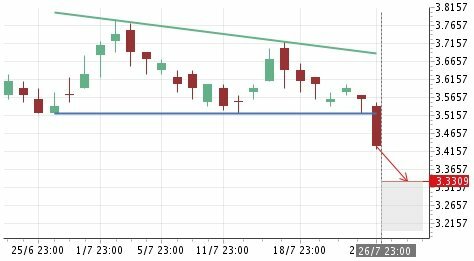 Based on my founded theory "Law of Gravity of Price" (a specific set of figure), there is a support resistance price at $3.20. And on Friday it reached that point, $3.21 to be exact, and rebounded. If you wanted to short, probably a few days ago after breaking down off $3.50 was a good point, but now not so. Unless it reach $3.17. You may be surprised why I am so precise about this figure, well it is a theory based on "Law of Gravity of price". 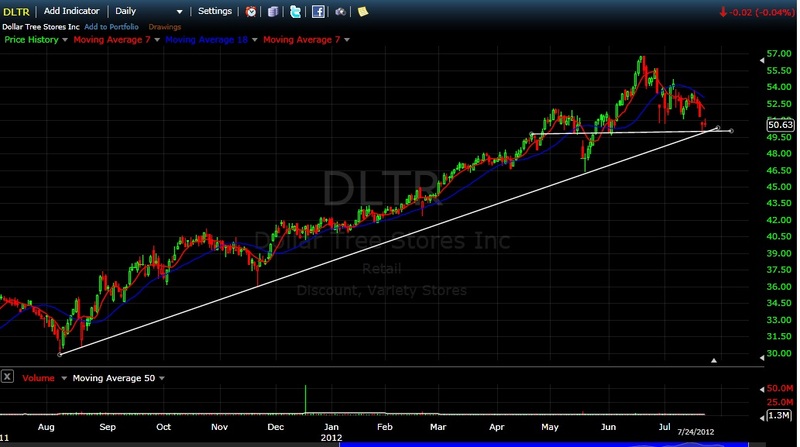 Recently, I have heard a lot of negative news and sentiment about this stock that I feel uncomfortable about shorting. Even the retailers are calling to short... Maybank downgraded this stock is to me, a signal of hope that for its earnings this time round 2-3 weeks away, Wilmar might beat expectation. Companies often beat earnings when expectations of it is low, and after successive misses. But of course, we have to wait till earnings to know if it is bad. Do take note that for Wilmar's past earnings, this stock gaps down bcos analysts' expectation is high. For next week, if you see if go up past $3.33, take note of the speed also. If it goes past $3.33 fast, it might mean people covering their shorting position, a rebound may be in sight. Double QE epectation from US and European Union propels market forward! Market really gone crazy these few days. It is crazy today with a up and up 200 points move. Do you remember I urge all to start to buy stocks, at a time when everyone said it is BEARISH! Just when everyone said short this and that, and Europe problems is growing. This is QE in the working these few days. After yesterday European Central Bank President Mario Draghi (Super Mario) talk to save Euro, it seems we are having Double QE expectation from both US and Europe next week. Today Mario talk with German Chancellor leaked out and many predict something is in the pipeline, fueling the market after lunch! Dow went up 100 points in minutes after lunch. The thing is unless there is something substantial either from US or Europe, short term players better take profits off the table by Tuesday. In fact I have closed half of my positions going into the weekend! 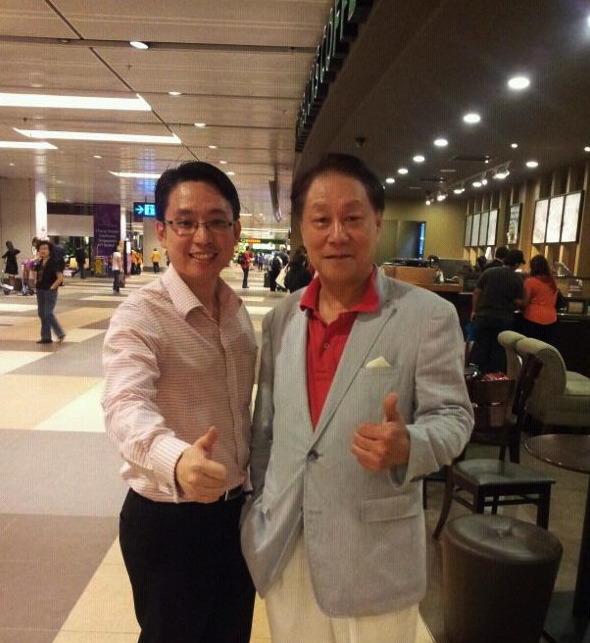 亚洲股神胡立阳老师抵达新加坡 Asia Top Investment Guru Mr Hu Li Yang arrived! 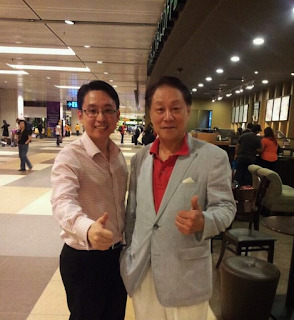 My Sifu, Mr Hu Li Yang has arrived! My photo with him in Airport when I welcomed him. Going to his seminar 2moro... will brief you on what he said about the MARKET in our seminar on next Thursday!!! SEMINAR on MR Hu Li Yang views of the MARKET! Join us! Topic: Revision of Mr Hu Li Yang's views of the Global Market & Singapore Market Outlook in August! Fee: 1 person $20, 2 person $30. Notes will be given to each participant. Today US Market got a lift from Europe as European Central Bank President Mario Draghi vowed to preserve the euro. U.S. jobless claims also dropped and durable-goods orders rose. Dow opened at 200 points up, currently it is up by 170 points at midday. As the month is coming to an end, we are already focusing on next week agenda. Number 1 would be the FOMC meeting on 31st July and 1st August. On 1st August, there will be the ISM report and the mega jobs report, Non farm payroll on the 3rd August Friday. Our jobs number prediction is that there is a good chance that this time the jobs number will be better than expectations. After 4 months of struggle with the jobs number, we might have thrown away the summer holidays jobs' slump behind us. But do remember that this is a prediction. Btw, next week there might be QE3 expectation again before Ben Bernanke speaks. 1) Market may go up because of QE3 expectation, if so, remember to sell into the expectation before Big Ben speaks on 31st July if you are a short term player. As a trader, we probably do not want to take the risk of no QE announcement again. 2) If market goes down after Big Ben Speech, you may want to take the opportunity to pick up some stocks going into the Jobs report on Friday. The best timing would be to wait for a Good ISM report on Wednesday to go in. If you do not want to take the risk, get your weapons ready to go in only after the jobs report confirmed to be good on Friday. 3) If Big Ben really has a stimulus package or QE3 coming up that is rejoiced by the market on 31st July, just buy straight away. Starting from August, our opinion would be to accumulate stocks at any opportunity whenever the market falls. US election is just 3 months away and we expect stock market to be bullish. An opportunity would be like what happened when the US market dropped for 3 consecutive days early this week. What US and Singapore sectors/ stocks to look at Mid Term?? I know your concern recently regarding the recent drop. I still maintain my bullish view mid term (2-3 months). In fact if you are not a day trader or swing trader but an investor, I urge everyone to get some stocks cheaply, and hold it. I am not so sure if you can get it at such a cheap price anymore 3 months later, when US Election is at its last stage. Please don't blame me when you lose money these few days. I am talking about months, mid term investment! I got a friend who asked me what kind of sector to look at. My answer is Look at the offensive sector! The sector which has been knocked down and out in the second quarter. Sector rotation is on its way. Forget about the defensive sector like healthcare and utilities. They gone up too much. Look at banking, energy and technological sector. As an example, I think this is one fantastic chance to get in on APPLE. Today it gaps down 30 points at open, from $600 to $570! This may be your last chance to get it on $570 this year. Wait till you hear their iphone launch. No chance already! What about Bank of America at $7? What about Goldman Sachs at $96? Financial sector has dropped much too. It has dropped so much. Let us wait for 3-4 months. Energy has reached its bottom in June, and running now. Get in. Baidu, another tech stock that I recommend when it is $100 has ran to $120 a couple of days back after a fabulous earnings. If You don't get in now, you might miss one of the greatest run this year, apart from the 1st quarter bullish run this year. If you are talking about Singapore stocks, get into Ezion hold it until it breaks $1! It will break $1 this year eventualy. Fundamentally it is the highest growth rate stock in Singapore. This is a growth stock! Sakari is beaten down and out! Look at it and hold it if you can. Fundamentally, its PEG ratio is good, less than 1, meaning their price is cheap compared to its growth. But remember these stocks are for investment, give it time, it will come back. Of course if you want to speculate, you need to do Technical Analysis and study your charts. For speculators who swing trade or day trade, you need momentum to be with you. And probably July hasn't proved to be such a month. Let us wait for something clearer. If not, go in with small lots if your hands are itchy! Join us in a Free Seminar on INVESTMENT!! 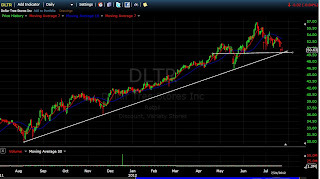 This is a stock on strong support having a upward supporting trendline, and a strong psychological support at $50. We shall see if it can move further up. If it does not break $50, likely to have a rebound. This is an opportunity spotted by our Options grad. We regularly discuss opportunities in our group discussion in Facebook. JOIN our "MILLIONAIRE TRADERS PROGRAMME" to make some $ together. For grads, can open a Spread below $50 with a ROI of around 18%. It hs been a few weeks since I monitor Singapore Stocks again. Do you still remember Starhub, our recommendation since a few months back? It has been strong and stronger each time. 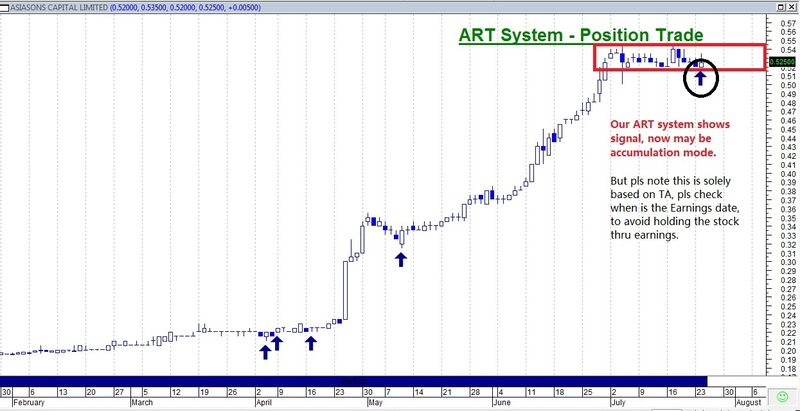 This time again, our ART system caught it at the reversal day. Now at $3.70, likelihood of hitting $3.77is high. $3.80 is a resistance. This is just for education. The risk reward ratio is not advisable to enter now. Not sure of earnings date, but do take note of the date. Singapore Stock Tip: Asiasons in Accumulation mode again? Someone asked me what are the stocks to look at amid these few days of drop. These are the stocks we should look at. There is a signal using our ART system for Singapore stock again. Once market turns better, it may move. Btw, pls check the Fundamental earnings date. Do not hold this stock through earnings. This is solely based on the Technical chart. STI now up by 22 points, Panic subsided in Asia, why? Some friends asked me about the market yesterday. They asked what is my feeling of the market. When I reached home, even my mum tells me that US market has dropped a lot after hearing from TV news. In the articles, we emphasized not to panic. That is the last thing a trader needs to do. Today Asia market stabilised as what we predicted last night. STI is up 23 points at midday. Hong Kong is closed because of typhoon. Shanghai is positive. Nikkei a bit down only. The reason why Asia recovers is because of how US market recovers in midday. In fact, yesterday before US market opens, we already told our readers to watch the movement of the DOW. It will determine if the panic still carries on today. Our definition of a real panic don't last for one day. It needs to go down at least 3 consecutive days. And in each of the days, it stays down and down. Not a V-shaped recovery like yesterday. Yesterday traders seems to take the opportunity to buy after the 240 points drop instead. Seems more like panic buy and cover shorts. Confidence is still in the market... Mid Term (next 2-3 months we are Bullish).. Try to accumulate your stocks now! 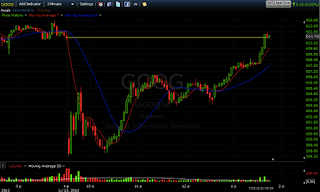 The Selloff today in US not that covincing; Google back to even! In our last article, we talked about studying today's market. At the open Dow opened 150 points down, went to 200 points down within minutes. Now at 1.30am, it is 120 points down. Like what we mentioned in our last article, it will be wiser not to panic and watch how Dow's direction is for the day. Our thought is that today's selloff is not convincing. Not a reason to panic sell yet, whether in Hong Kong or Singapore or US....I heard from CNBC that the volume of the market isn't high last Friday and today. Maybe the fear is a profit take rather than a big selloff. But let us monitor Europe and US market again 2moro. If it signals an up day, we probably know that this selloff won't sustain long. Mid term (2-3 months) we still maintain our view to accumulate stocks at any opportunity since US election is 4 months away. Btw, 2moro night will be a big night on Apple earnings. It is going to shake the market on Wednesday. If it beats earnings convincingly, it might start to propel Dow again. So let us watch carefully. 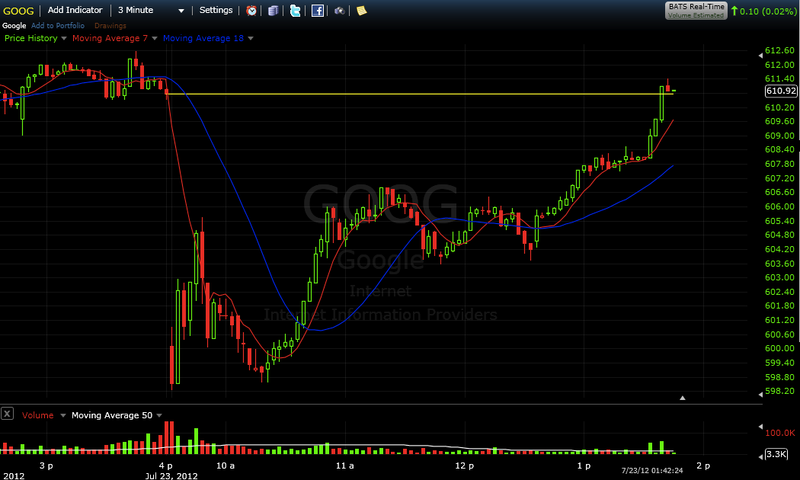 This stock Google (GOOG) is back to even now: Almost a giveaway of higher prices in the next few days. 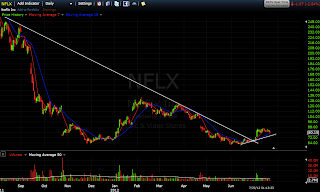 US Stock Tip: Netflix (NFLX) white knight story? I like white knight stories. 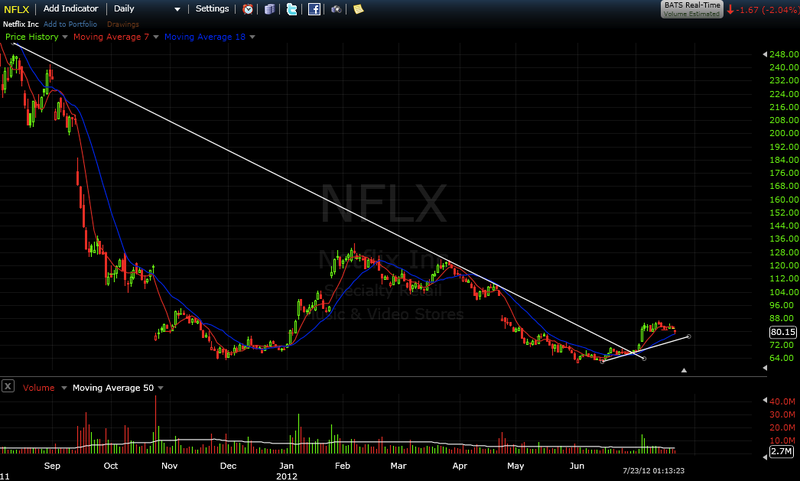 This is one in the pipeline... A turnaround for Netflix (NFLX)? Netflix (NFLX) is a company that was Wallstreet darling 3 years ago, rising from $70 to $300 in 2 years before it collapsed to $60 in 6 months. FTSE down by 1.72%, Dow Futures down by 1.19%, what do we do? Yes, it is that Euro problem again. Spanish government bond yields picked up where they left off Friday, soaring to another round of euro-era highs. The yield on the 10-year benchmark ES:10YR_ESP +3.00% traded at 7.45%, a rise of nearly a quarter of a basis point, and well above the 7% threshold widely viewed as potentially unsustainable in terms of long-term government borrowing costs. The two-year yield ES:2YR_ESP +14.00% jumped nearly 0.90 percentage point. My suggestion is not to press the panic button now. At this moment, we shall see how the US market react today and 2moro. Let us see how the Dow Jones will be after the opening. If Dow Jones manage to stabilise and recover to within 80 points, 2moro the Asian market might stabilised. Of course if Dow still remains 100 plus points down today, Asia market might still drop. If Dow manage to recover 2moro after 2day's fall, it means that market is still strong and today's fall is a ploy by the BIG players to enter market buying. 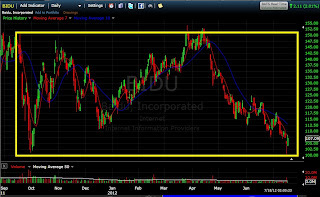 Yesterday wanted to post about this stock Baidu (BIDU) listed in Nasdaq. I hesitated because I discovered it will release earnings next week Monday after market close. Today it moved up another $3, now at $110. 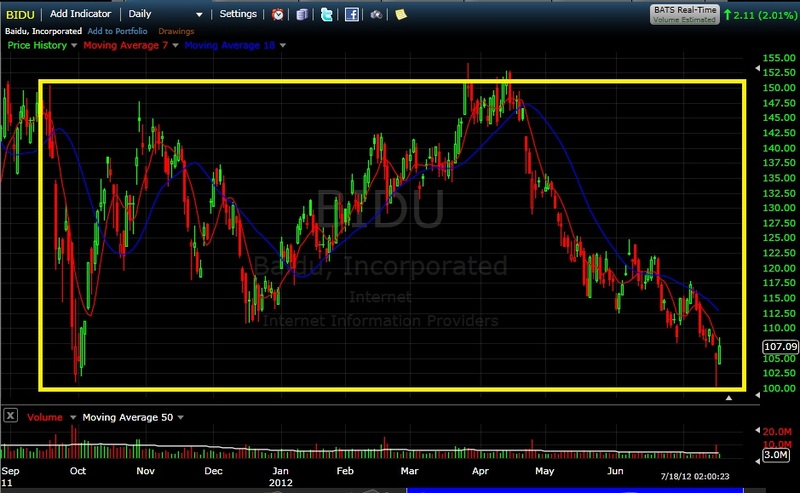 It does seem like Baidu (BIDU) has a support at $100, yesterday stood above this figure. But I would suggest not to enter now. Since Monday is earnings. Let us study the results. But I do think this stock has been beaten down a lot because of China problem. Let us see. Can be mid term stock play. Singapore Stock Tip: Yanlord moving up? Have you been following our call? Yanlord appear to be good since my 15 June post, up more than 10% already. 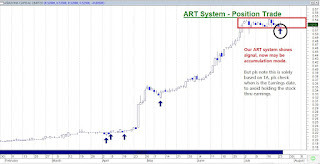 Right now it is giving us another signal from our ART system, showing us some momentum is coming. For entry we are looking above previous day high $1.325, Stoploss 1.265. Timeframe 2weeks - 2month. Short term target $1.49. If you are thinking of shorting the market, think again! I saw a training school in Singapore calling to short SMISCI and HK recently. They covered their losing short position and suggest people to look at shorting again. I disagree with this view. In fact our strategy for July have been perfectly right. Do you remember we asking everybody to exit position before the jobs report as we think it might miss forecast. After that we tell everybody to watch for next 3 days to know the direction of market. It actually falls for 4 straight days. We told everyone to anticipate a reversal. 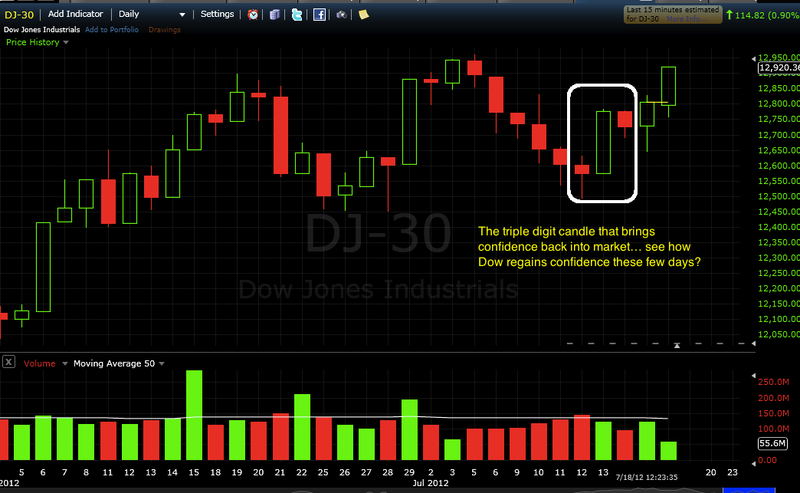 We mentioned that one way to know the reversal is a triple digit day which will bring confidence back in July. After last Friday triple digit rebound, this week stock market continues its climb. We mentioned yesterday that July will be a month on QE3 expectation and a dissapointment if Big Ben fails to act. Today, the market tilts again to think that there might be QE3 afterall. Ha, like what we said, July is about QE expectations. I suggest do not short any positions now, especially the index futures. We feel it may be like throwing your money into drain. If fact, we expect July won't be bad. The US earnings reports have been so far quite ok, not as bad as feared. Today we again focus on Ben Bernanke speech. Again there is expectation of QE possibility. And again there is disappointment he did not announce it. And again there are people who still continue to interpret that he will say about the QE in his next speech. And again they may be dissapointed. This has been going on and on for the past months. As Election looms around in 4 months time, this speculation will still continue until Big Ben really gives the green light. Everytime, a bad report like jobs report or retail report turns up worse, Wallstreet will call for a QE again. My opinion is that this chatter will continue throughout July. Yes, no, Yes no, so confusing! And bear in mind, Big Ben will appear in the FOMC meeting again on 31st July. I think there will be expectation again. My opinion is that for short term players, we better sell our stocks before that day. But I have no doubt that this anticipation of QE will carry the market forward. I still believe July will not be a bad month, like May. If you are a long term player, do start to look at some stocks worth holding and investing in. You probably have seen the lowest point in the market in May. We are bullish this second half of the year. We got it Right again in Energy Sector turnaround in June!! 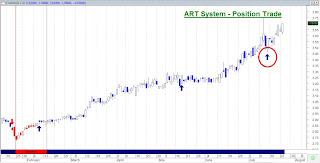 Did you make money on our recommendation on trend change in the Energy Sector? Or have you forgotten our recommendation? Check out our post on 18th May. We told everybody to anticipate a turnaround very soon! We told everybody to note of China as they are one of the biggest consumers of commodities and energy. The interest rate cuts last month just propel the sector forward. On the 12th June, we issued again our bullishness in Energy sector. Check out some Oil exploration and integration companies in America. It is not hard to see most of the companies reach their low in early June and it has gone up ever since. We have been right again on our sector analysis. This is because we have been using a special sector indicator to analyse sectors in trend in US. We are right on banking sector, healthcare sector, technological sector, predicting their turnaround each time. If you would like to know more, join our seminar "SECRETS of the US Market" on the 31st Aug (Tues) and 1st Sep 2012 (Wed). Asian Stock Guru Hu Li Yang: 3 years of Prosperity ahead! I think that all Europe related problems will gradually be solved. If I am right on my analysis, Europe economy will start to recover in the second half of the year for 3 consecutive years. This means the world economy will also enjoy three years of prosperity. The world is still enjoying the low interest rate which has never happened before. The probability for it to suddenly reverse in the next 2-3years is low. Oil, gold or other commodities have ventured into a long tern Bear Market. The spectacularly growing property price has stabilised. Hence, money will flow back into stocks. Rather than an explosive forward burst in the economy, a slow growing economy will enable the stock market to go a long distance. Investors are still immersed in the realm of the European crisis. Pessimism is high and investors willingness to participate is low. We have almost reached the low point of the Financial crisis in 2008 and stock market has reached a low rebounding territory. Reflecting on history, these 4 factors that can propel the stock market are seldom seen happening together. Now it has appeared right before our eyes. Shares Investment will hold a conference staging Mr Hu Li Yang and Prof Chan Yan Chong, both are Gurus in the stock market. US Market Finally rebounded with a triple digit figure! I have been telling everybody to be patient after the bad Jobs report. We told everyone we should expect market to turn better end of this week or next. Today it happened after Dow dropped for 6 consecutive days. At midnoon, Dow increased by an overwhelming 180 points. What a Show of confidence by Dow. Of course, you might want to credit it to relief over China's GDP. I think it is also due to the market being oversold. It would be very interesting next week how things unfold. I would say my strategy would be more bullish now. Whenever Dow increase by a triple digit figure, it might signify a temporary rebound. Couple it with 2 up days that close at a high would be great. Let us see if Monday also increase. I heard in CNBC that there is anticipation on Sunday that China might introduce some policies to help their economy. Let us also see whether it will happen. So let us watch how Monday's market direction is and take note of China news. Do not forget that we are in earnings season. Today the market also gets a boost from the financial sector. Wells Fargo and JP Morgan has better then expected earnings results. And these 2 companies are the representatives of the financial sector. If financial sector's earnings are great, look forward to more positive results from other companies this month. For Singapore I would expect STI to rally past 3000 soon. Let us see if it can cross 3030, to have a quadruple breakout. In Malaysia, KLCI has been rallying on after breaking its 1600 resistance. In fact it is at all time high now and the best performing index in the world. Expect more KL companies to hit all time high soon. Just last month, at a seminar with Affin bank, I told our Malaysian friends that once 1600 is broken 3 days without coming back, expect the market to fly. Indeed now it is at 1630. 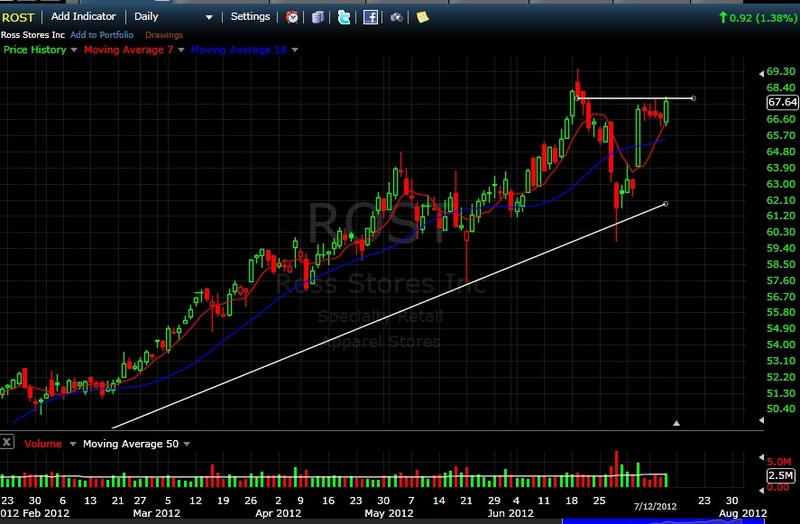 US Stock Tip: Ross Stores (ROST) on the move up? What actually happened in US yesterday? Yesterday, there is again anticipation in Wallstreet of QE3 package in the FED minutes at 2am Singapore time. But after FED did not give any hints on any stimulus, the stocks tumbled down. Within 30 minutes, the DOW dropped 90 points on the dissapointment. I saw Apple, one of my favorite companies swiftly dropped $8. There were many other stocks that swiftly dropped too. However, I am glad to say that DOW recovered all of the 90 points drop for the rest of the day, which is 1.5 hours before closing 40 points down. 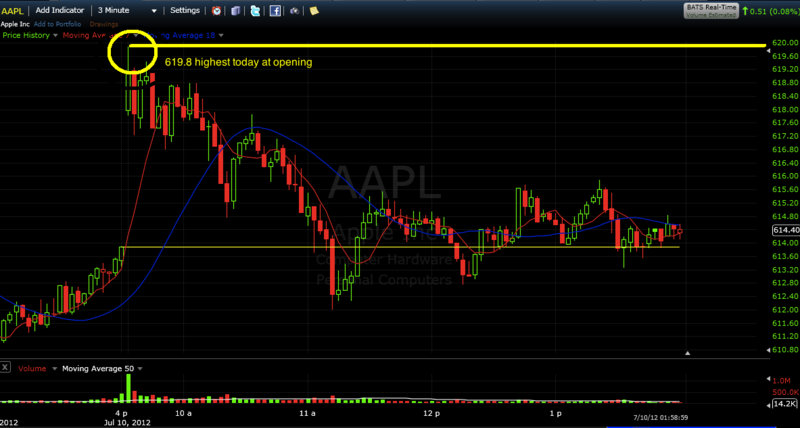 Apple came back strong to close above $600, recovers the early $8 loss, which is a good sign. How I interpret the whole incident is that following the report, the market indeed sell on the news of dissapointment. But market became rational again and buy it up. I suppose this is how this month market might play out. Anticipation and Dissapointment. Then Anticipation and perhaps dissapointment again. But with each dissapointment, our expectations of QE3 drops. Currently I would say, perhaps the market is less forward looking to QE3. Btw, US market has been falling for 5 consecutive days now. I do expect these couple of days to recover a bit of the losses. Let us watch to see when US recovers. I am looking forward to a triple digit gain for a revival of confidence. A Lackluster Tuesday on Wall Street but Apple reached our first target! Tuesday proved to be a restless day at Wall Street and not a good day for tech. Currently in midday, Dow Jones decreased by 30 points and Nasdaq is down by 11 points. Nasdaq is down probably because AMD, the chip maker, pre-announced its second-quarter results that included weaker-than-expected sale. Europe's FTSE index which is up 37 points did not seem to light up the US market, which is a rare occasion today. Today is the 4th day DOW decreased and I think today should probably end in the red. It has been lingering at the support of 12700 now. Let us see if this support provides a bounce for DOW in the next few days. As we have mentioned in the previous article, it is normal that these few days we feel the after effect of the poor Non farm payroll result. 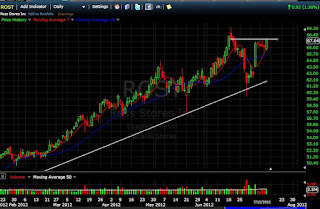 Today the earnings reports of some companies did not help to lift the market. Today it actually gapped up to highest point $619.8 before retreating from top to now $613. The thing is I founded a theory called "The Law of Gravity of Price" which can predict the support and resistance of stocks easily even without looking at charts. This is like a set of Fibonacci figures. And $620 is one of them. That is the reason I told everybody to sell first once Apple reach $620. A lot of times, our students are amazed at how accurately I can predict prices even without looking at charts. This really takes time and skill. I learnt it by staring at prices the whole day ever since I am 13. No kidding, that was when I am forced by my dad to watch the teletext, prices of stocks for him. As a trader, I also monitor what I called "The Speed of Price Movement". Looking at the speed of price movement and how prices move back and forth, we can often predict if stock price will move up or down. This is something I think you may not read in books or from gurus. Because to me, trading is an ART, not only a Science. There are some things that computers cannot programme for retailers now, like speed. If you would like to know more about the ART of TRADING, do come for our seminar to find out more. Btw we have a FREE SEMINAR coming up, do join us with your friends. 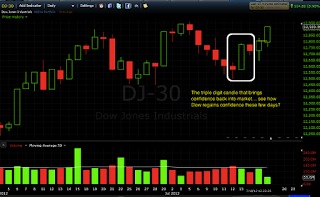 - Are turnarounds of the Dow Jones Industrial Average and the Straits Times Index happening in July? Singapore Stock Tip: Yanlord and Midas has chance to go up? Stop loss can be placed at 3-5% below entry price. Singapore Stocks Tips: Olam and STXOSV Near Resistance? STI drop -49.47points today ending at 2929 today, some friends actually called me to ask about market outlook. The few big question now are basically 1) Is it downtrend already? 2) Is there anything to short? Not that familiar with charting? Come join us and find out more! Bring your friends along. US Stock Tip: Has Apple Strong Run ended? Since my last email my on recommendation on Apple, it has been running non stop. My opinion is that Apple's run may not have finished. Now the price in mid day is $613. Looking at the daily chart, we can see that on Friday there is a small red candle. This is what I called a show of strength and a potential trigger setup for higher prices. Though the day has not ended, we can see the big body green candle, indicating bullishness again. Without the red candle, I may not be bullish. The red candle signal a pause, but also a place to buy. 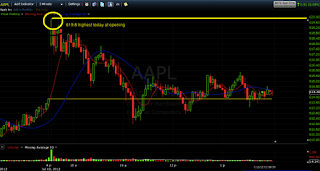 But having said that, you need to take note of Apple resistances at $620, $625 and the highest point at $645. All these are resistances that Apple needs to clear on its way to Earnings Day on Tuesday, 24th july, after market close. How to Play the Stock Market in July? US$4200 profit in just 2 days trading APPLE! What an Amazing Comeback from Dow Jones!